Reese's Peanut Butter Cup & Beer: Is It Possible? During last Spring's coverage of the Savor Craft Beer Experience I read about a new fad in craft brewing - combining peanut butter and chocolate into the brewing process. Being a major peanut butter fan, I was intrigued with this concept; yet promptly forgot about it when Summer ascended. In the Fall, I was reminded due to my Lost Dog Cafe app alerted me that the Twisted Pine Brewing Company - Rhesus Chocolate Peanut Butter Stout was being poured at one of their locations. I hurried over that day to taste the Rhesus and was both disappointed and encouraged. The disappointment arose because the Rhesus didn't really taste like a Reese's peanut butter cup; instead these flavors were subtle and the beer more stout like. On the other hand, I was encouraged because I did like this beer even though I had to strain to appreciate the Reese's qualities. 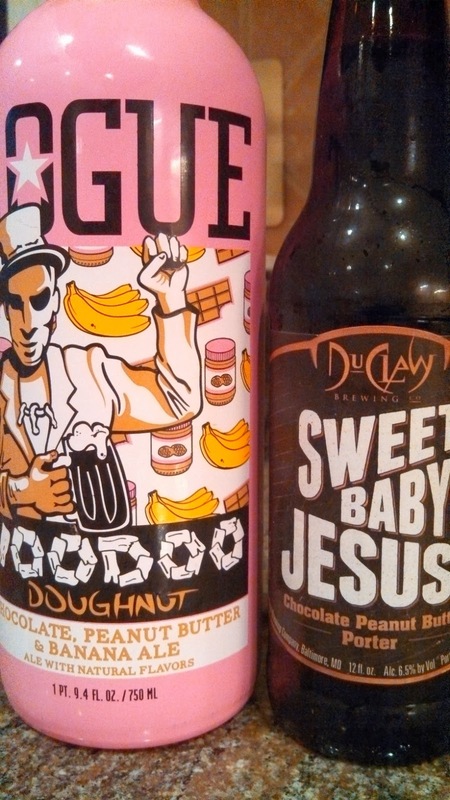 Over the next couple of weeks I searched for more beers in this style and finally landed the beer that many had recommended - the DuClaw Brewing Company - Sweet Baby Jesus!. This is a porter from a Maryland brewery I've been following for quite sometime and pretty much nails a Reese's cup. There is plenty of chocolate and peanut butter - but also balance - as the tail finishes with a smooth hoppy character. Keeping with the lexicon - so far this is the Holy Grail of Peanut Butter Chocolate beers. At the same time I was able to find a Rogue Brewery - Voodoo Chocolate, Peanut Butter & Banana Ale easy to spot in the pink bottle with Voodoo’s "Memphis Mafia" doughnuts. This is the sweetest of the three with plenty of banana throughout - nose, palette, and finish. In my opinion, the excess artificial banana was it's downfall - overwhelming the chocolate and the peanut butter. To others in our tasting party - that was not a problem. Finally there's one more in this style I am familiar with that I have not been able to sample: Florida's Rapp Brewing Company - Chocolate Peanut Butter Stout. I'm not sure how wide their distribution but will seek them on theCompass Alcohol Locator our next trip to Tampa. 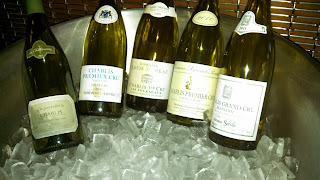 Last week Pure Chablis came to D.C. to showcase the region's wines and I was fortunate to be invited to a lunch at Proof. The lunch was hosted by Jean-François Bordet, the current President of the Chablis Wine Board (in addition to winemaker at Domaine Séguinot-Bordet) and Françoise Roure of Burgundy Wines. 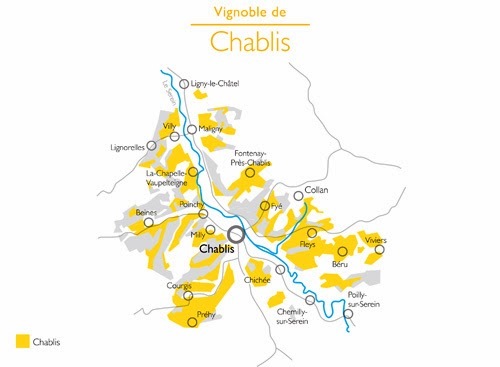 It's easy to forget that Chablis is situated in Burgundy even though it lies closer to Champagne than Côte de Nuits. That means its a cold grape growing climate; we saw fascinating pictures of frost fighting techniques and snow covered vines. But the cold brings acidity which is a coveted characteristic of Chablis wine. 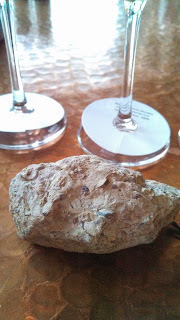 Minerality is another characteristic. The soil is 150 million years old and the Kimmeridgian Limestone is loaded with fossilized oyster shells (see accompanying photo). Like many Medieval town, Chablis is built upon a waterway, the Serein River, which provides two more characteristics to Chablis wine. First, vines are planted on the hills overlooking both banks, with the right side receiving the evening sun and the left bank the morning sun. This means the right bank receives more exposure - providing a little more flavor to the Chardonnay grapes. Second, Chablis wine is usually fermented and aged in steel; but when oak is used, it's neutral oak. This is partly because of the region's proximity to Paris - only two hours away by train. Wine was transported by river to the capital city by barrel and then returned to be reused once more. Regions residing further away from Paris did not receive returns and became to rely on new oak each year. We started with the La Chablisienne Chablis La Pierrelée 2011 ($23). La Chablisienne is an old cooperative, started in 1923, and accounts for one quarter of the region's wine production (10 million bottles). This wine is a cuvée sourced from grapes grown throughout the region fermented in stainless steel and aged on lees in tank. The result is a light wine - not powerful - but displaying finesse with a lychee aroma, a green apple flavor and fresh acidity finish. The next was Mr. Bordet's wine, the Domaine Séguinot-Bordet Chablis Premier Cru Fourchume 2010 ($35). The domaine is located on the right bank, far north corner of Chablis around the hamlet of Maligny. Jean-François is the 13th generation winemaker and this is the oldest continually operating winery in Chablis - that's 1590 for those counting. Now that's some history. Interestingly, he practiced winemaking in Michigan - learning about Riesling and Gewurtztraminer. When he returned home in 1998, he became the youngest winemaker in Chablis accompanied by his grandfather who was the oldest. The Premier Cru Fourchume is at once elegant and intense with a fresh lychee aroma, an iodine earthy mid, and a long refreshing finish. This is one quality wine - very nice. The Premier Crus kept coming with the Simonnet Febvre Chablis Premier Cru Vaillons 2010 ($30) and the Louis Moreau Chablis Premier Cru Les Fourneaux 2009 ($27). 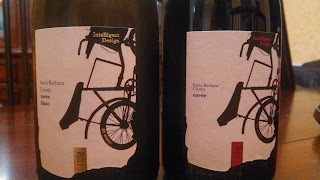 The second seemed a bigger wine, more structure with vanilla notes, but both displayed the fresh acidic finish. Two notes, the Simonnet Febvre is a left bank wine whereas the Louis Moreau is a right bank produced by a two hundred year old domaine. We finished the afternoon with a Grand Cru - the Domaine Servin Chablis Grand Cru Blanchots 2011 ($45). There are only seven Grands Cru climats in Chablis and the Domaine Servin right bank vines face east-west - giving more morning sun exposure. The result is more fruit (this is also a rare unoaked Grand Cru), less minerality, and even less acidity - as compared to the others. Despite the un-Chablis style - this wine is impressive. Probably my second favorite behind the Séguinot-Bordet. Cheers to Chablis and a hearty thanks to Pure Chablis and Proof. This past Wednesday @wineclubguy of Uncorked Ventures hosted the weekly #winehchat and featured tow wine from Wesley Ashley Wines in which I was able to receive samples. The winery's website contains an interesting video describing their birth and the Intelligent Design brand so I recommend watching. 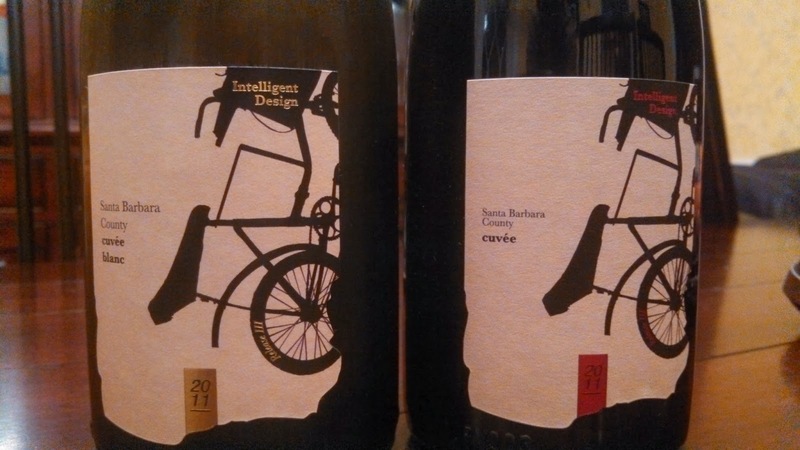 As for the wines, we sampled their 2011 Intelligent Design Cuvee Blanc White Rhone Styled Blend ($34) and the 2011 Intelligent Design Cuvee ($34) . The Cuvee Blanc is an intriguing blend of Viognier 60%; Roussanne 30%;and Grenache Blanc 10% - all sourced from Santa Barbara. It is a very nice wine, starting with floral aromas; plenty of depth and a creamy sensation due to some ML treatment. The one downside was the reduction in acidity - that is intentional - based on their consumer's profiles. Yet, all in all, a very tasty wine. The red Cuvee is another Rhone styled blend, composed of Grenache 75%; Syrah 20%; and Petite Sirah 5%. It starts with a leathery aromas, transitions to a deep raspberry flavor with decent structure and finishes long with spicy black pepper. Another very nice wine. Pair with Dawes - performing soon at the Lobero Theatre. Cheers. I recently received the good fortune of having five spirits shipped to me from Heritage Distilling, a craft distiller located in Gig Harbor, Washington. Jack-pot. And just as importantly. 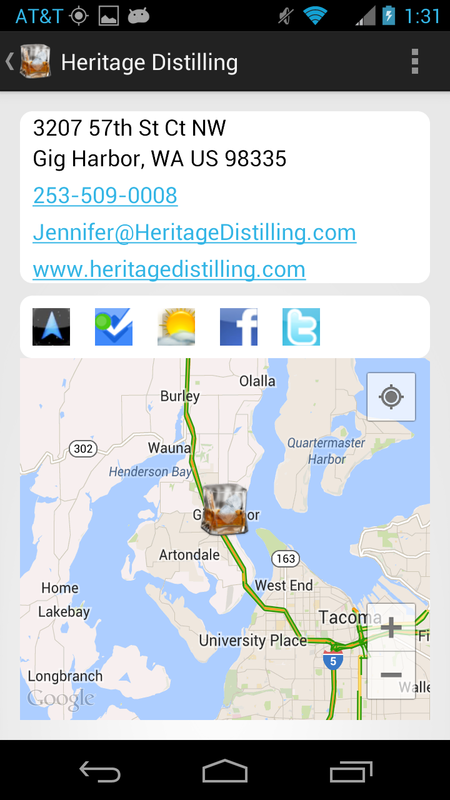 I learned about the Washington State's craft distilling designations and this distiller's unique “Field to Flask”™ ethos. First, in order to be classified as a Craft Distillery in Washington State, a distillery must certify on a monthly basis, that fifty percent of their non water raw materials are grown in the state. Heritage extends this further by establishing their “Field to Flask”™ program where they manage every part of the process. They work directly with the family farmers providing grain and fruit, mill this grain themselves, cooking the mash, distilling the wort, and so on and so on. The distilleries main brand is the Elk Rider series which pays tribute to their Western heritage - particularly the pioneer families who resided in what is now Olympic National Park. I sampled the Elk Rider Blended Whiskey, which is - simply - fantastic. The aroma is a sweet leathery texture, the mid-palette toasted grain - the the finish, sweet, clean and smooth. Don't waste mixing in a cocktail - neat or on the rocks is where this whiskey belongs. This bottle failed to live though the weekend. The next whiskey was oh so cool, particularly for history buffs like me: the Commander’s Rye Whiskey - based on our Founding Father's original 1797 recipe. Heritage pays tribute to their state's namesake by recreating this rye whiskey using a combination of rye, corn and malted barley. They result is a raw, petrol aroma followed by a very pleasant mid-palette ending with a sweet, almost powdery sugar finish. Very interesting finish. Once again, consumer neat or on the rocks. 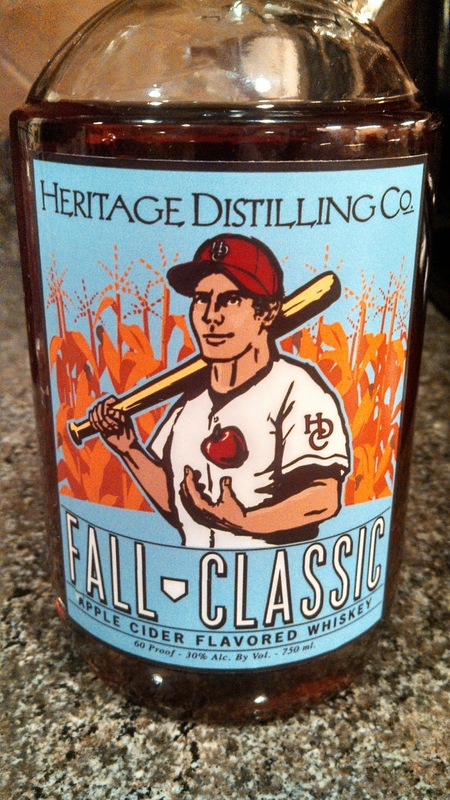 It appears that Heritage is leveraging the apple-moonshine popularity by creating the Fall Classic Apple Cider Flavored Whiskey. This is made in the moon-shine tradition, by mixing corn whiskey and apple cider and sold in a jug. I was at first hesitant since I normally avoid these types of "flavored" spirits - but the Fall Classic won me over starting with the nutmeg- apple aroma. The flavor is then all apple with tail a mouthful of dry spices. This one will be going into a Josie Russell. The final two spirits where a first, vodka and gin distilled from Washington grapes - many different grapes to be precise. Apparently after the second distillation, all varietal characteristics of the grape disappears. The HDC Vodka is triple distilled - leaving no recognition of grapes or brandy - just a pure clean spirit from the sweet start to the smooth even finish. 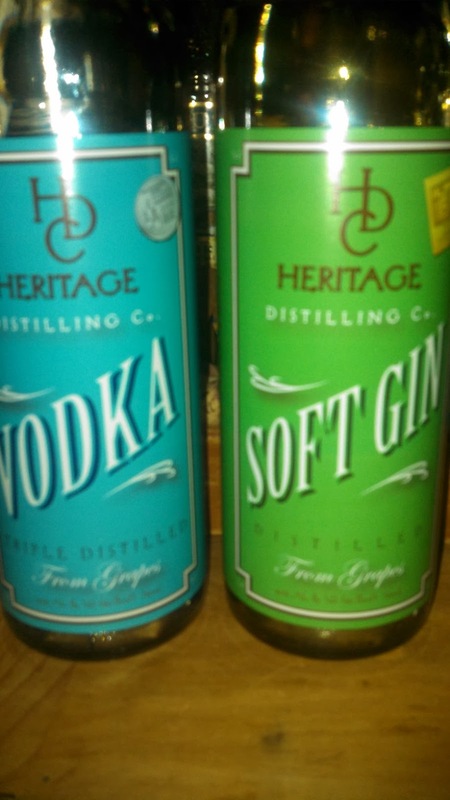 The HDC Soft Gin is basically the HDC Vodka infused with several botanicals. It is more citrus than most gins, with a lively spicy finish. The distiller recommends as a base for a Bloody Mary and with the citrus and spice - you may only need tomato juice and Worcestershire. Also a spirit with pedigree - 2013 “DOUBLE GOLD-BEST GIN” medal winner at FiftyBest.com Int’l Tasting (New York). Nice. 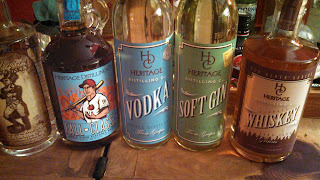 Heritage Distilling epitomizes the renaissance in the craft distillery market. They produce a broad and unique portfolio of locally sourced, hand held spirits. Cheers to that - and pair with the American outlaw blues of the JD Hobson Band. 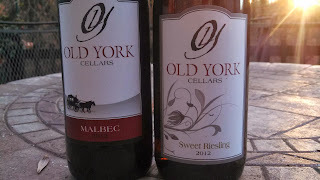 This past Thursday was another quarterly installment of Virtual Wines, hosted by Old York Cellars, an online video tasting of two wines with wine maker Scott Gares and Sommelier Laurin Dorman.This episode featured their newly released 2012 Malbec ($18) and 2012 Sweet Riesling ($17). Being recently bottled, the Malbec needed some time to breathe and was quite tight when first opened. It is a light Malbec, 12% alcohol, but exuded a dark cherry aroma. On the palette, the flavor was light and smooth - decent acidity - wouldn't recognize as that varietal wine - but a very drinkable wine. The Sweet Riesling was more semi-sweet than sweet at 3% R.S. with plenty of acidity to bite through the sugar. This time the flavor profile was to spec; easily recognizable as a Riesling - this one with pear aromas and green apple flavor. I'm sure this will become a tasting room favorite. Besides sending me the two wines to sample, the best part of the tasting is that Dorman and Gares suggest food pairings for each wine. For the Malbec, they suggested leaner red meats, pork, and light tomato based pasta; for the Riesling, spicy Thai chicken, chile, pumpkin ravioli, and even cheesecake. Fortunately we had just brought home pumpkin ravioli and indeed the Riesling was a suitable match. Thanks. The next Virtual Vines tasting is planned for January 30th and will feature their 2011 Vidal Blanc and 2012 Syrah. Cheers and plenty of live music at the winery to pair with these wines. Recently I read an article titled Pa. wine production ranks 5th in the nation, which surprising since for the past few years I was under the impression that either Virginia or Texas ranked 5th - both behind the usual suspects: California, Washington, Oregon, and New York. The article did not site any data to support their claim, and no response from author Karissa Shatzer, so I decided to research myself. There are basically two appropriate sources of data, the Alcohol and Tobacco Tax and Trade Bureau (TTB), which regulates the wine industry at the Federal level, and the National Agricultural Statistics Service, which, as their name implies, collects agricultural data. We could also use unofficial data from winecompass.com for ranking states by the number of wineries operating in each state (Figure 1). In this scenario, the figures aligned to conventional wisdom (at least mine) with Virginia and Texas competing for #5. However, I don't think winecompass.com was the source that Ms. Shatzer used. She stated 5th largest wine producer and the best source for that data is the TTB's Statistical Report by State - Wine. (See Figure 2.) The data for 2012 reveals some mighty unexpected results. 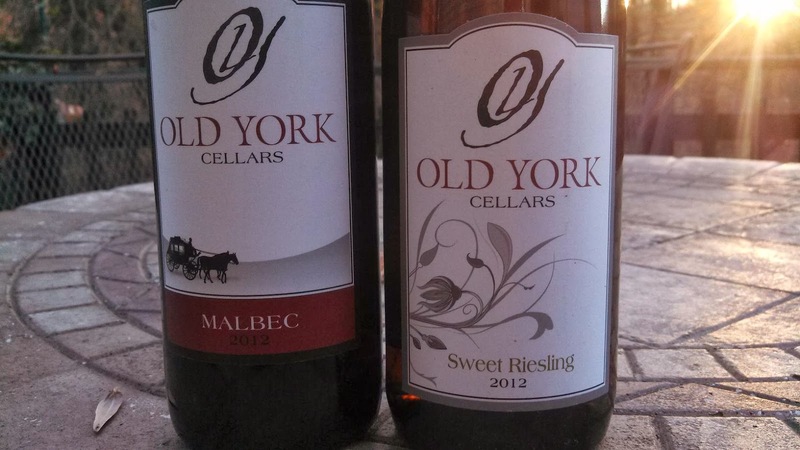 New York leaps out as the #2 overall wine producer - perhaps a legacy of Canandaigua Brands. (Is Manischewitz that popular?) In any case, besides New York overtaking Washington, the other surprises are the unlikely inclusion of Vermont, Kentucky, Florida, and New Jersey. The TTB data includes cider production which most likely accounts for Vermont's high stature as well as non-grape fruit wine (New Jersey) - but how that explains Kentucky and Florida - I have no idea. According to the TTB, Pennsylvania is the 6th largest wine producer with Virginia (16th) and Texas (11th) out of the top 10. I mentioned that the TTB data includes cider and wine made from non-grape fruit, so what about limiting the data to just grape wine production. For this type of data, we need the National Agricultural Statistics Service and their Noncitrus Fruits and Nuts 2012 Preliminary Summary. The first chart I noticed was on page 48 titled Grape Bearing Acreage, Yield, Production, Price, and Value - States and United States: 2010-2012 data (Figure 3). Displaying the top ten shows Pennsylvania and Michigan high on the list at the expense of Oregon, Texas, and Virginia. Now, this data includes all grapes, whether used for wine, table, or raisins; and thus needs to be limited further. A more appropriate source is page 52 of the Noncitrus Fruits and Nuts report: Grape Processed Utilization and Price by Use - States and United States: 2010-2012. This report encompasses grape wine production and I've listed the top producers for 2010 and 2012 in Figure 4. These results align more closer to my preconceived notions on wine production by state; although Michigan has passed Virginia to capture the 6th spot. Using the 2010 data, Pennsylvania is in fact the #5 wine producer. However, wine grape production declined sharply from 2010 -> 2012 which could be explained by changes in methodology in the surveys; moving towards lower yielding, but higher quality grapes; or perhaps moving grape utilization more towards jellies instead of wine. Regardless, according to this table, Pennsylvania is ranked 8th, not far below Texas, Michigan, and Virginia. Like most statistical analysis, these results vary by year, by data source, by data inputs - so yes, it is complicated. According to the TTB's total wine production (including non-grape wine and cider) in 2012, Pennsylvania was ranked 6th overall with Virginia and Texas out of the top 10. Yet, restricting our analysis to just grape wine production, Pennsylvania falls to 8th, with Texas, Michigan, and Virginia rising above the Keystone state. What was more unexpected was the rise in Michigan's grape wine production almost doubling in two years. I wonder if the number of wineries doubled as well or this results from much larger yields? In any case, the exact ranking of states probably only matters for bragging rights between government officials or winery associations. For consumers, it shows that there are plenty of local wine regions to explore. Cheers to that. After a day of cycling I ended with the normal practice of grabbing a beer at my local Wholefood Market. 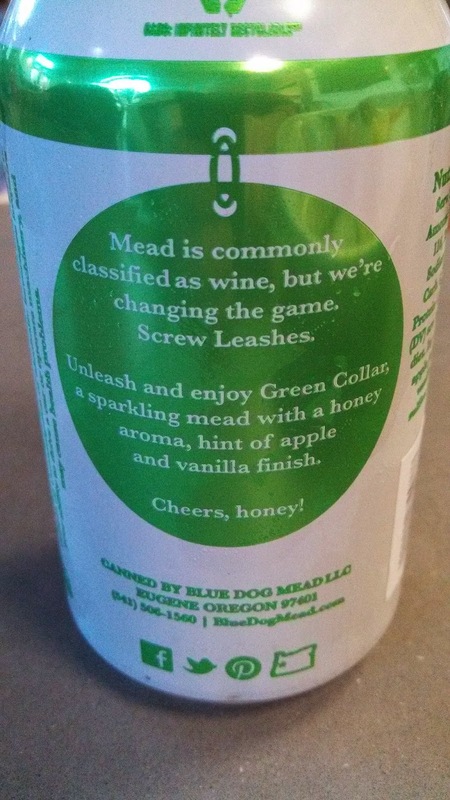 The on tap menu was heavy on heavy beers so I ventured to the singles isle and sighted an interesting green can holding the Blue Dog Mead Green Collar Cyser Mead. 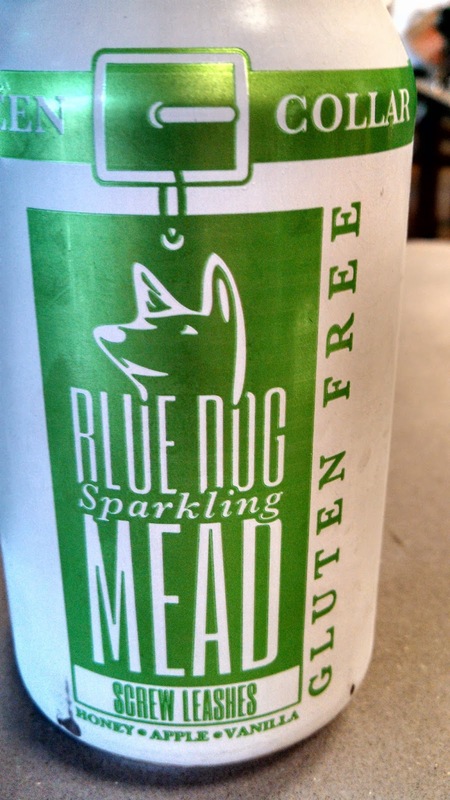 Sparkling cyser mead at that. Cyser is a traditional mead made with apples, so I thought, why not. The apples are sourced from Washington State and fermented with Wildflower Honey. After the injection of CO2, the result is a refreshing beverage, with a surprising vanilla finish and not that laden with R.S. Quite thirst quenching and a decent pairing with local oysters. Cheers. Recently I found this interesting item in the orphaned wine & beer bin at my local Wholefoods and decided to give it a temporary home. The La Quinta De Oro Agave Wine is produced in the Tequila region by the San Gabriel Beverage Group using 100% Blue Agave and fortified with 100% agave spirits. The fortification cuts off at 20% abv so that the beverage maintains its wine status. The color is a cloudy light yellow and the aroma all agave. In fact you'd think you held a neat tequila in your hands. On the palette, the fresh agave flavor appears and then rapidly dissipates leaving a watery bland finish. 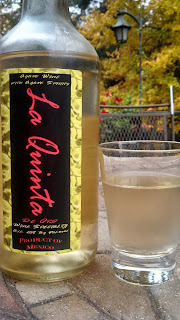 Very difficult to get used to - because from the aroma and initial taste, I was expecting the strength of a tequila which obviously was not present. Fortunately we lucked into the appropriate food pairing, spicy chili, where the chili spices reinforced the weak finish. Instead of falling flat, the agave wine and chili combination was quite pleasant. Thus we only recommend paired with Los Lonely Boys and chili. Cheers.